As Trump and Congressional Republicans promote huge tax cuts for corporations and wealthy Americans, a massive new leak of tax evasion files shows that what America needs most is Republican support for tax law enforcement. While Republicans talk often about supporting police, that policy does not extend to the tax police, which is the function of the Internal Revenue Service. Instead, the GOP has long been hostile to enforcing tax laws. 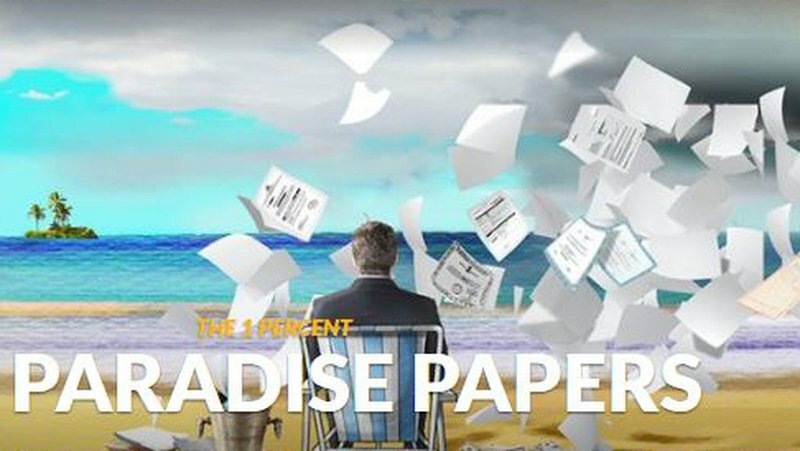 A dozen people in the Trump circle, among other super-rich Americans, show up in the secret files—dubbed the Paradise Papers—of an offshore law firm that specializes in helping ultra-wealthy people escape their tax obligations. So much for Trump’s claim that always and everywhere he will put America first. The most notable name in the secret files is billionaire vulture investor Wilbur Ross, Trump’s ethically challenged secretary of commerce. The Paradise Papers also go far beyond tax cheating to reveal hidden business connections, including how Ross profits from investments connected to the family of Russian autocrat Vladimir Putin. Unlike the earlier Panama Papers released a year ago, the Paradise Papers are heavy with information about American citizens, with at least 31,000 Americans or American addresses found in the leaked files of the Appleby law firm, which specializes in offshore tax avoidance. Appleby says it has done nothing illegal and is the victim of a criminal breach of its files. That’s true but misleading. It is not a crime in Switzerland, for example, to help Americans commit tax fraud. That doesn’t mean nothing illegal is going on, just that Swiss law favors criminal tax cheating by non-Swiss, to cite one of many such examples. If the IRS were robustly funded and directed to go after offshore tax cheats, it would go a long way to eliminating the red ink in annual federal budgets since President Clinton ended his eight years with four years of budget surpluses (two years if you exclude surplus Social Security tax revenues). Instead, the IRS has been under attack from Republicans for decades. And they have been handcuffed for almost two decades by rules put in place by Republicans in Congress. The tax police budget has been cut more than $2 billion since 2010 when measured in inflation-adjusted dollars. At the same time, the number of taxpayers has grown, the economy has grown and so have creative new strategies that let the biggest corporations and super wealthy defer and delay paying their taxes. Further burdening the tax police are numerous changes mucking up the tax code, changes that primarily help the political donor class delaying or escaping taxes. The IRS staff was about 99,000 full-time equivalent positions in 2000. It was down to about 76,000 four months before Trump took office, Page 67 of the latest IRS Data Book shows. It has shrunk more since. About 33,000 of the remaining IRS employees are tax collectors. Only about 10,000, or 13%, are auditors looking for tax cheats. Mostly they do routine audits by sending out letters asking about simple mistakes on tax returns, like numbers reported by taxpayers not matching what banks, brokerages and employers reported to the tax police. Indeed, the words “Internal Revenue Service” do not even appear in Trump’s proposed budget for the fiscal year that began Oct. 1. “IRS” gets one mention—at Page 39 in a table about minor changes in policy. And in the report explaining the budget, the IRS gets just one passing mention, at Page 37. The way the spending cuts are applied is even more revealing than the numbers. Senior auditors and criminal agents are being urged to take buyouts. It’s as if your local city council moved detectives from the bunko squad and told them to stop looking for con artists and to focus on bicycle thefts. It’s worse than that. The remaining auditors, on the corporate side, are required to tell big companies in advance exactly what they are looking for and to stick to those areas, ignoring evidence of other tax issues unless they are obviously criminal fraud. These rules apply only to big companies, not individuals or small businesses. We have higher standards for inspections of fire safety, nursing home care and pet shop cleanliness. In most places, inspections like these are unannounced, all the better to catch misconduct and keep all operators on alert. These advance warnings on audits are a form of institutionalized corruption. The policy began after the 1997 and 1998 Senate Finance hearings on abuses of taxpayers. The testimony alleging serious abuse of taxpayers by IRS agents was shown to be bogus in subsequent reporting by The Wall Street Journal and by me in The New York Times. In 2008, after I retired from the NYT, I wrote about those issues in Tax Notes. How Congress undermines tax policing is examined here by Professor Leandra Lederman of Indiana University. Fairness in taxation is not just about what the statute books say or the administrative rule books require. It is also about having enough auditors, criminal investigators and lawyers to pursue tax cheats without fear or favor. The only way to get that is for people to call and write their representatives in Congress and demand robust funding for tax law enforcement with a focus on identifying, auditing and then collecting the taxes from—and in some cases prosecuting—tax cheats of all kinds. That’s what America needs much more than tax cuts for the already rich and the corporations they own. The Republican point man on the tax-cutting project is Rep. Kevin Brady, chairman of the House Ways and Means Committee. Contact his staff here. The members of the Ways and Means Committee are listed here. On the Senate side, the Finance Committee is chaired by Republican Orrin Hatch of Utah. A list of members is here. The Senate Finance Committee staff are at 202-224-4515 or by fax at 202-228-0554. Contact your representative or senators.